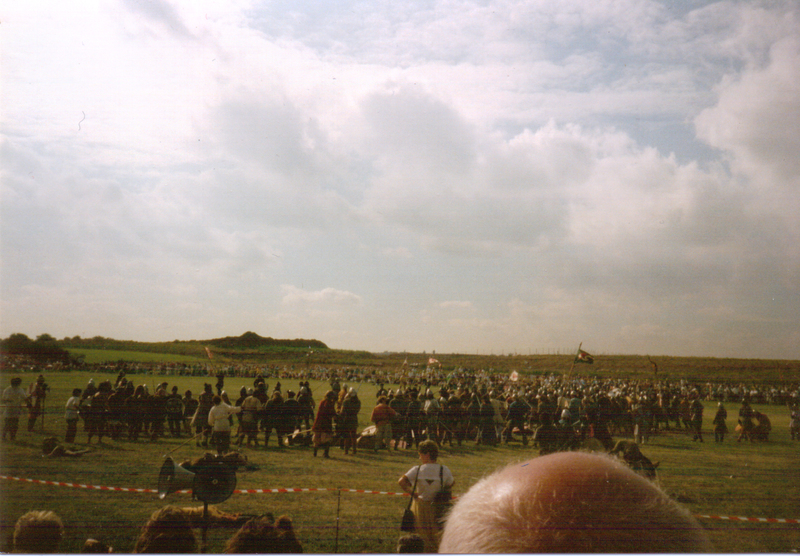 I was there, at the Battle of Maldon. 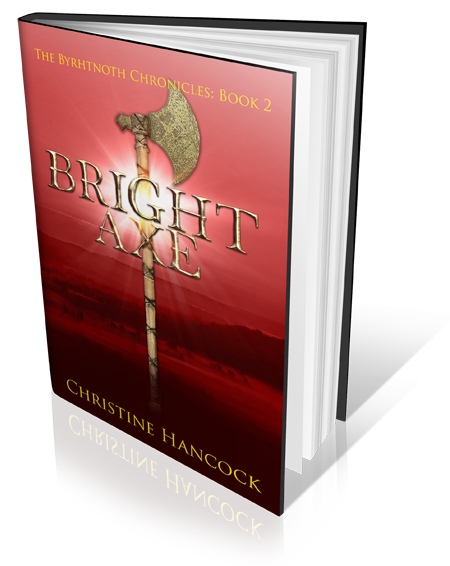 Obviously Byrhtnoth was there – it couldn’t have happened without him. But the writer of this blog was there as well, almost exactly a thousand years later. 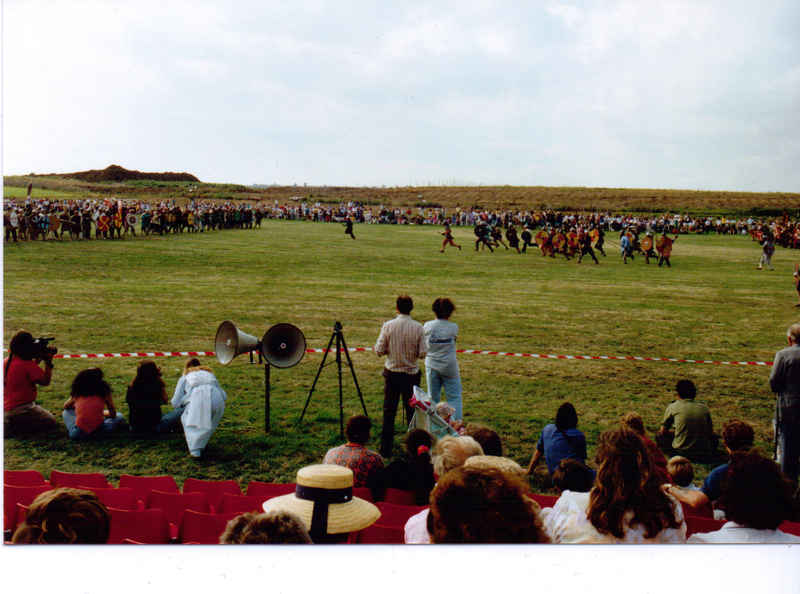 The Battle of Maldon Re-enactment Spectacular took place on the 10th and 11th August 1991. 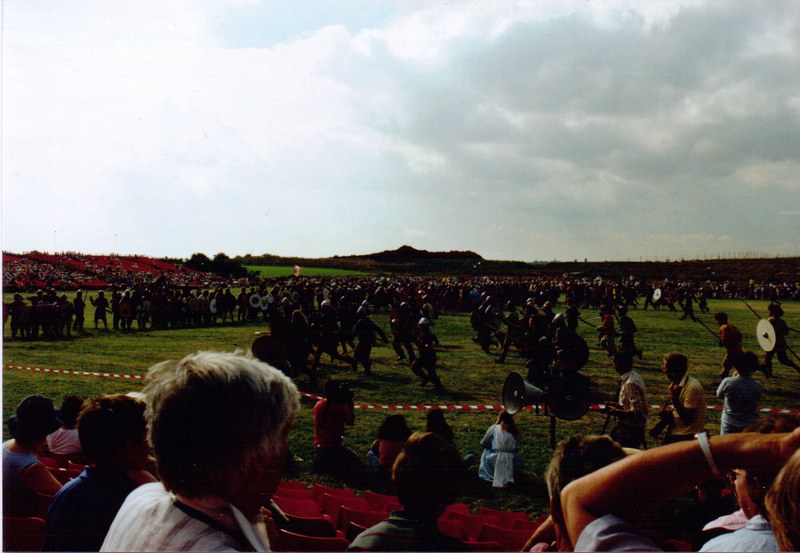 I took photos and I still have the Souvenir Programme, which I dug out when I started writing about Byrhtnoth. It’s very informative. Recently I was clearing out the old family home in Chelmsford. The first things I went for were the photographs. Box after box of slides and prints – a whole life in pictures (not much in the way of old ancestors unfortunately, but that’s another story, or blog). 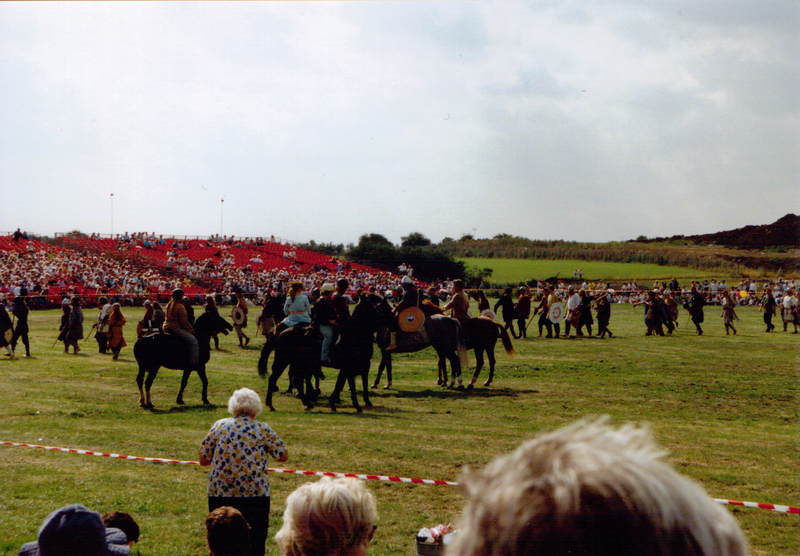 I had scanned in my own pictures of the re-enactment and soon found some more in my father’s collection. 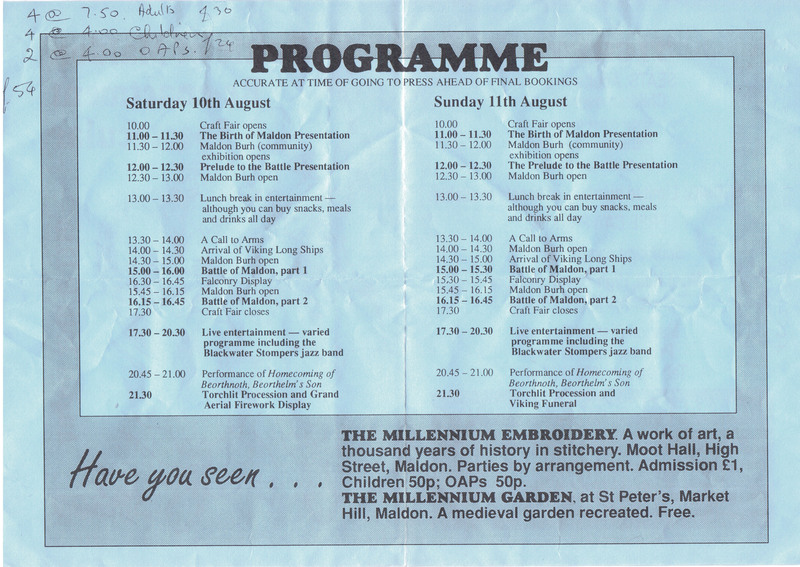 When we moved on to sorting out books I found on a shelf, tucked away amongst cookery books and books about gardening, my parents copy of the programme, complete with, tickets etc. 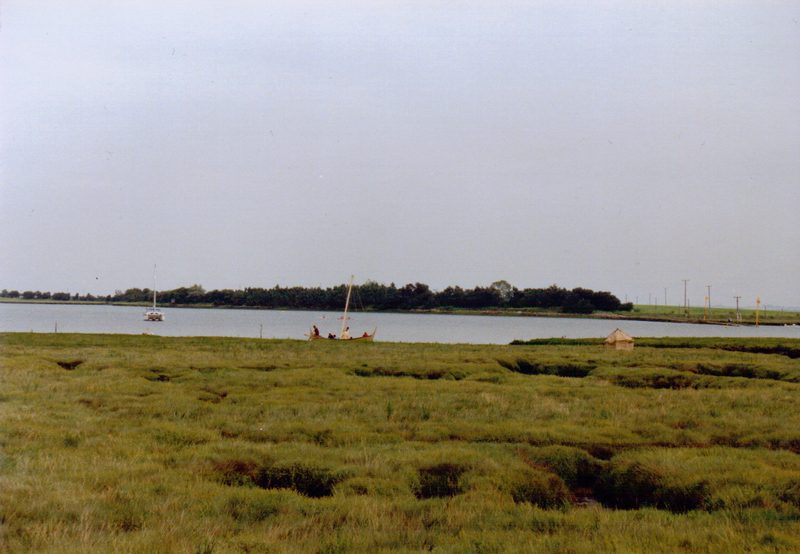 So here, in pictures, is the story of a visit to the Battle of Maldon. 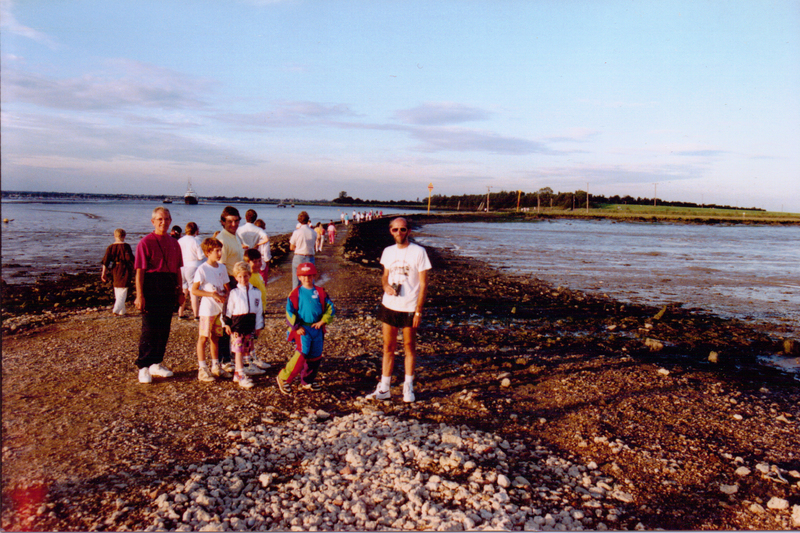 4 adults – me, my sister and our husbands, 4 children – 2 each, 2 OAPs – my parents. 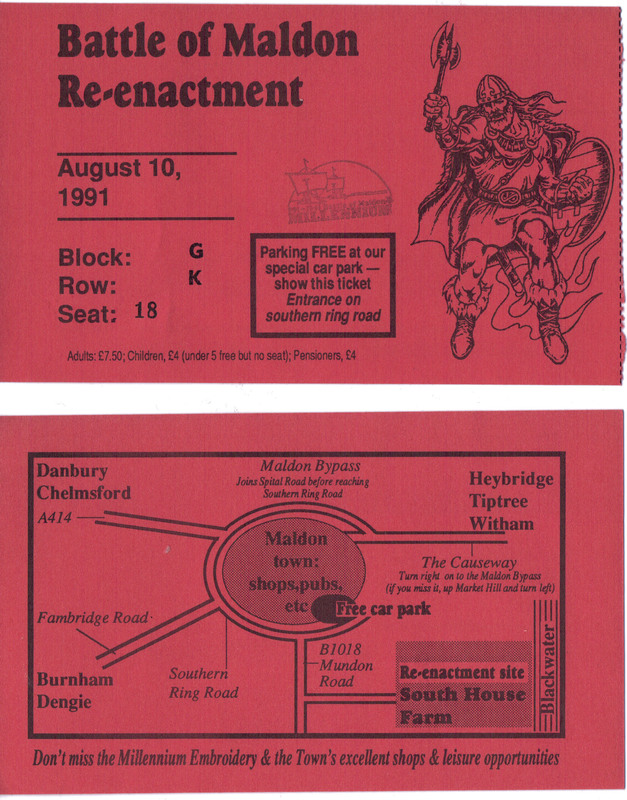 Ticket including map of site. 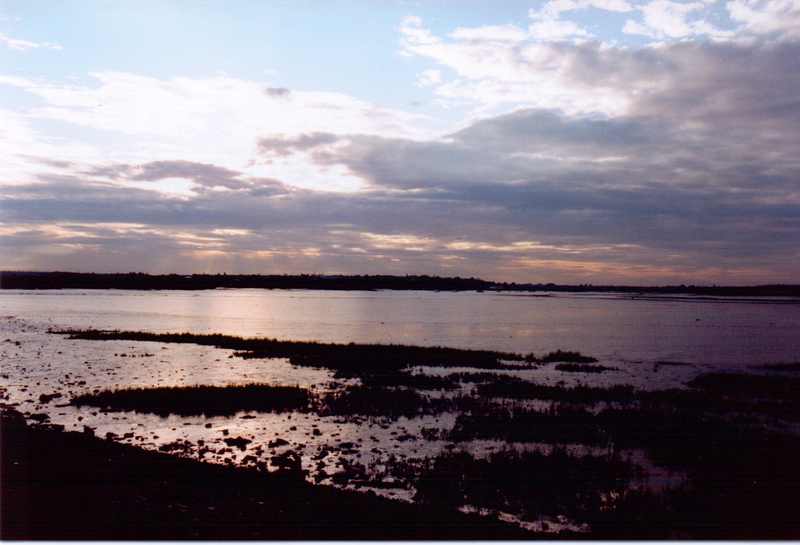 Mustn’t miss Maldon’s excellent shops and leisure opportunities – was that what the Vikings came for? 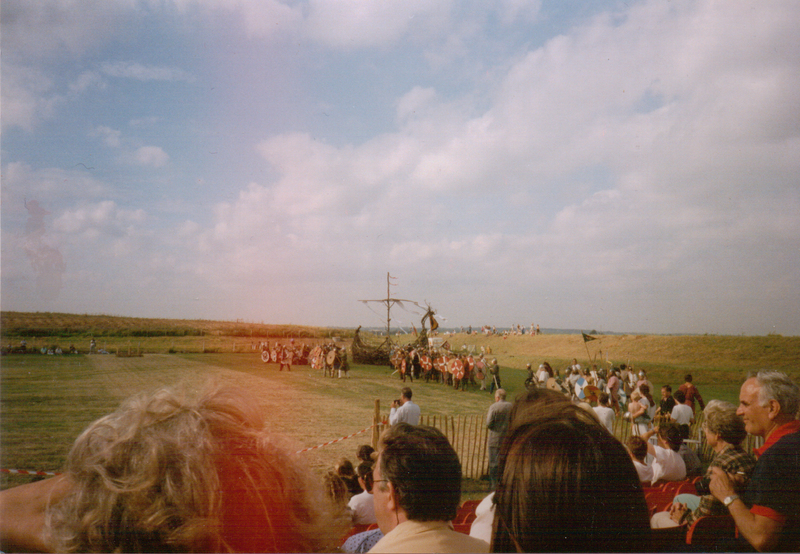 Think this must be taken in the Maldon Burh – the encampment for the re-enactors. All the children wanted to do was to get their hands on the weapons. Not sure if they are pretending to be attacking Vikings or defending Anglo-Saxons. At 12.30 the Viking Longships arrive – was this it? The programme did say they are smaller replicas! Now that’s a Viking Longship! The Vikings taunt the Saxons? 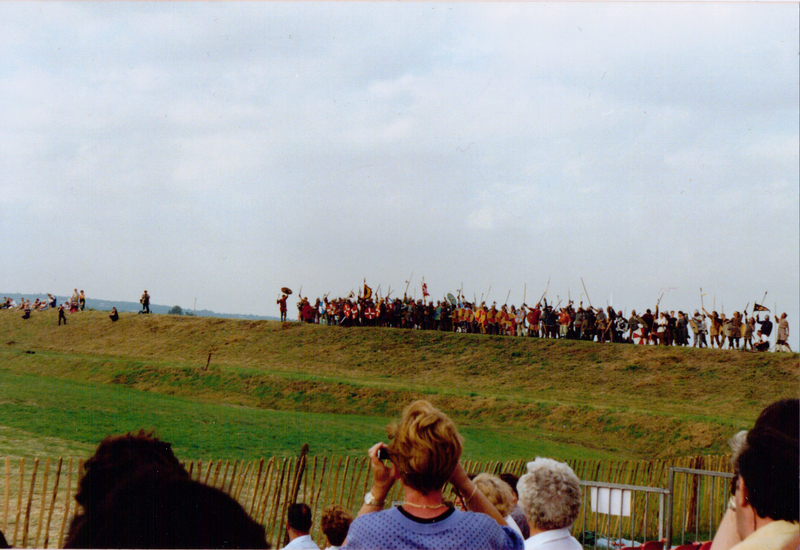 Someone’s on the ground – Must be the Death of Byrhtnoth. I don’t remember what we did during the evening (jazz band?) but I do remember the finale. According to the programme there was a performance of Tolkein’s “Homecoming of Beortnoth, Beorthelm’s son” followed by a Torchlight precession. All I can say is that the sound system was very bad and that we sat for what seemed hours, as a lot of people, a long way away, wandered around in the dark with torches. I have a video of this somewhere, but I don’t think you’d want to see it! Finally, there was the Grand Firework Display, accompanied by music – The Ride of the Valkyries. 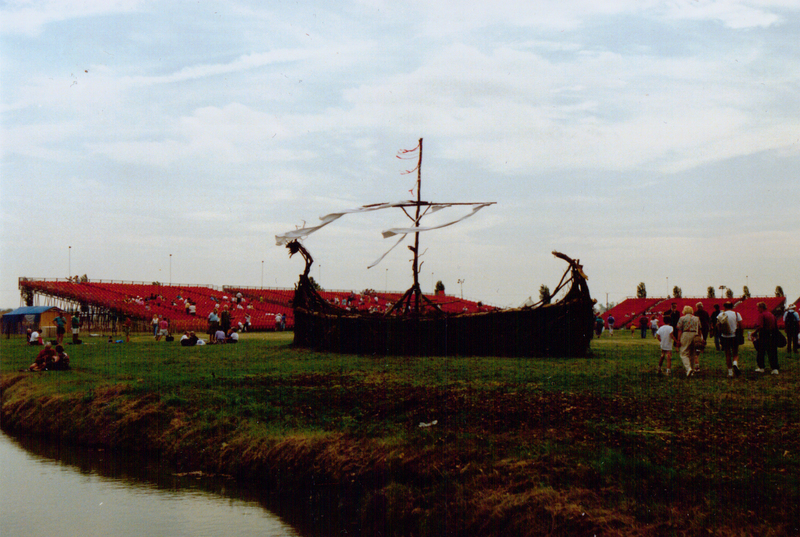 I was a bit disappointed that we were at the Saturday performance, not the Sunday – that was when they burnt the Viking ship! It was a long day, but worth it. 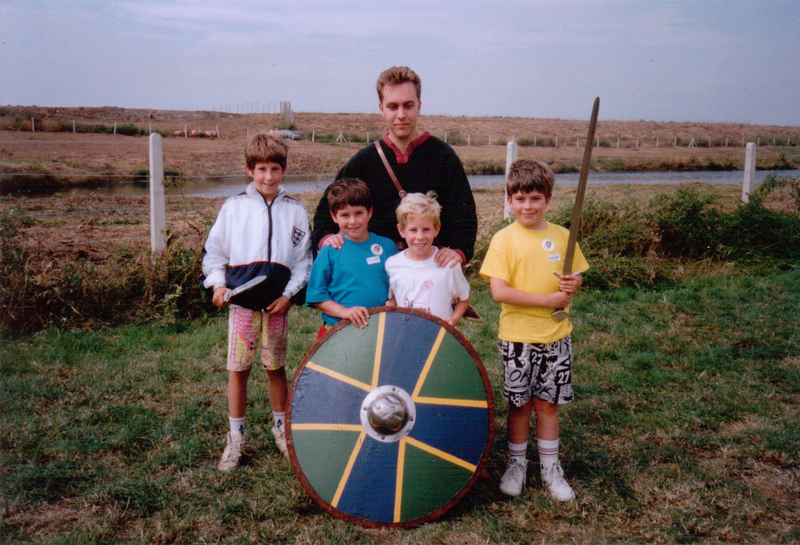 I wish I’d paid more attention at the time, but I never thought that, twenty-five years later, I’d be writing a book about Byrhtnoth.